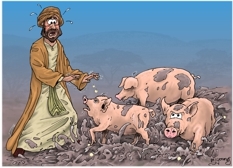 (Jesus said) “Do not give dogs what is sacred; do not throw your pearls to pigs. If you do, they may trample them under their feet, and then turn and tear you to pieces. Simple lighting from the right illuminates this scene. 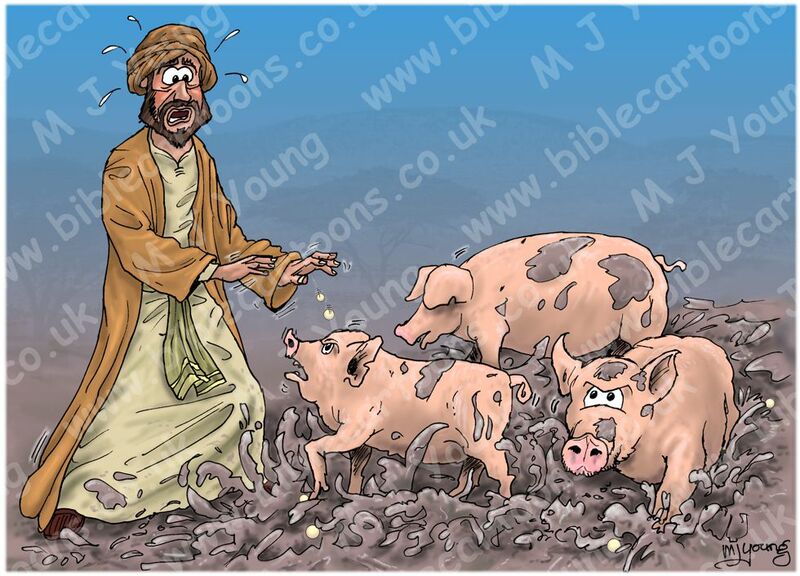 Unnamed man looking worried as some pigs turn on him & his “pearls of wisdom”! This is another literal interpretation of the words of Jesus. The picture shows the pigs trampling a man’s pearls & turning on him. The look a bit savage, don’t they?! You can see a few pearls falling from the hands of the man, with a few more scattered about in the mud. I enjoyed colouring up the oozing mud & pigs in this scene! I decided to include some faded images of trees & a hill picture of Israel, just visible in the background to complete this cartoon.